In a classic tale of science taking twists and turns before coming to a conclusion, two teams of researchers—one a group of theorists and the other, experimentalists—have worked together to solve a chemical puzzle that may one day lead to cleaner air and renewable fuel. The scientists' ultimate goal is to convert harmful carbon dioxide (CO2) in the atmosphere into beneficial liquid fuel. Currently, it is possible to make fuels out of CO2—plants do it all the time—but researchers are still trying to crack the problem of artificially producing the fuels at large enough scales to be useful. In a new study published the week of June 12 in the journal Proceedings of the National Academy of Sciences (PNAS), researchers report the mechanics behind an early key step in artificially activating CO2 so that it can rearrange itself to become the liquid fuel ethanol. Theorists at Caltech used quantum mechanics to predict what was happening at atomic scales, while experimentalists at the Department of Energy's (DOE) Lawrence Berkeley National Lab (Berkeley Lab) used X-ray studies to analyze the steps of the chemical reaction. The scientists are part of the Joint Center for Artificial Photosynthesis (JCAP), a DOE Energy Innovation Hub, whose goal is to convert CO2 into high-value chemical products like liquid fuels. JCAP is led by Caltech in partnership with Berkeley Lab, the Stanford Linear Accelerator Center (SLAC), and UC campuses at San Diego and Irvine. "One of our tasks is to determine the exact sequence of steps for breaking apart water and CO2 into atoms and piecing them back together to form ethanol and oxygen," says William Goddard (PhD '65), the Charles and Mary Ferkel Professor of Chemistry, Materials Science, and Applied Physics, who led the Caltech team. "With these new studies, we have better ideas about how to do that." 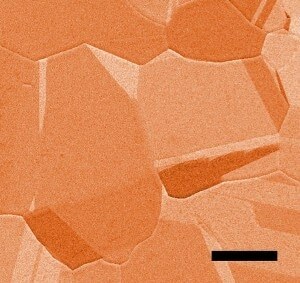 The metal copper is at the heart of the reaction for converting CO2 to fuel. Copper is a catalyst—a material used to activate and speed up chemical reactions—and, while it aids in the production of ethanol when exposed to CO2 and water, it is not efficient enough to make large quantities of ethanol. At Berkeley Lab, researchers exposed a thin foil sheet of copper to CO2 gas and water at room temperature. They found that the copper bound CO2 weakly and that adding water activated the CO2 by bending it into the shape needed to ultimately form the ethanol. However, when the theorists at Caltech used quantum mechanics and computer models to predict the atomic-level details of this reaction, they found that pure copper would not bind the CO2 and that water would not activate it. This left both teams scratching their heads until they noticed that the copper in the experiments contained tiny amounts of oxygen beneath its surface. The theorists went back to their quantum mechanics equations, adding in a tiny amount of sub-surface oxygen, and were happy to find their calculations all agreed with the experiments. "We do our experiments virtually in computers," says JCAP research scientist Hai Xiao (PhD '15). "And this allows us to trace how the electrons and atoms rearrange themselves in the reaction, and thus unravel the correlation between the fundamental structure and the activity." The theorists also predicted that when too much oxygen was present, the CO2 would not be activated. Indeed, when the experimentalists deliberately added extra oxygen into the mix, this prediction was confirmed. "This back and forth between theory and experiment is an exciting aspect of modern research and an important part of the JCAP strategy for making fuels from CO2," says Goddard. Subsequent X-ray studies helped further narrow down the role of the oxygen in the reaction. "Having oxygen atoms just beneath the surface—a suboxide layer—is a critical aspect to this," says Ethan Crumlin, a scientist at Berkeley Lab. "The X-ray work brought new clarity to determining the right amount of this subsurface oxygen—and its role in interactions with CO2 gas and water—to improve the reaction." The scientists say that the presence of the oxygen in the copper causes some of the copper to become positively charged and this, in turn, stabilizes the CO2 so that it can bind to water and take on the bent configuration essential to eventually making ethanol. Based on the new findings, the Caltech researchers then used quantum mechanics to predict ways to make the reaction even more efficient. In a second paper published this week in PNAS, they report that a copper surface that is striped with both neutral and positively charged copper will better speed the reaction along. The team is now using this strategy, called a Metal-Embedded-in-Oxygen-Matrix (MEOM), to predict the best oxide material—either copper or something new—to place next to the neutral copper strips to achieve the fastest reaction. "Quantum mechanics lets us find the best ways to arrange the atoms and takes us closer to the goal of converting carbon dioxide to fuels and other useful materials," says Goddard. The first PNAS paper, titled "Subsurface oxide plays a critical role in CO2 activation by Cu(111) surfaces to form chemisorbed CO2, the first step in reduction of CO2," is authored by Crumlin, Marco Favaro, and Junko Yano of Berkeley Lab; and Xiao, Goddard, and Tao Cheng of Caltech. The second PNAS paper, titled "The Cu Metal Embedded in Oxidized Matrix Catalyst to Promote CO2 Activation and CO Dimerization for Efficient and Selective Electrochemical Reduction of CO2," was authored by Xiao, Goddard, Cheng, and Yuanyue Liu, a Resnick Sustainability Institute Postdoctoral Scholar at Caltech. This research was supported by the DOE Office of Basic Energy Science and by JCAP.